Gastroenteritis in an infection of the stomach and bowels. It can cause watery diarrhoea and sometimes vomiting. The infection is usually due to a virus (rotavirus is the most common) but sometimes bacteria can cause it. Symptoms can last for up to 10 days. Gastroenteritis is very easy to spread and is spread by touch. The main treatment is to keep your child drinking fluids. They need these to replace the fluid lost from the vomiting and diarrhoea. Otherwise they will become dehydrated. 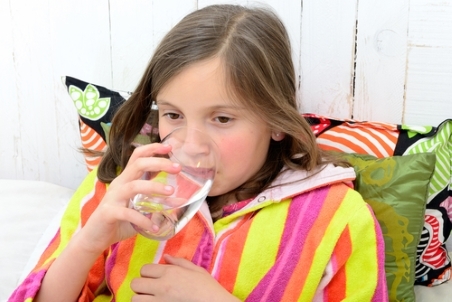 Young children are more prone to dehydration. milk (if your child is at least 1 year old). Don't use full strength drinks or sports drinks as they contain too much sugar and can make the diarrhoea worse. If you are breastfeeding, carry on but feed more often. You can offer your baby clear fluids as well. Keep giving your child food if they want to eat. Don't stop food for more than 24 hours. Your child will need more rest than usual. Medicines to stop diarrhoea and vomiting are not helpful. Gastroenteritis is spread by touch, so hand washing is the most important thing you can do to prevent it spreading. Wash your hands before and after handling food and changing nappies or toileting. Wash your child's hands too. Don't share food and drink. While your child has diarrhoea it is best to keep them away from their playcentre, kindergarten or school, as they can pass the illness on to other children. Information about the best ways to treat your child's gastroenteritis. Information about the causes and treatment of gastroenteritis from the Paediatric Society of New Zealand and the Starship Foundation. Written by the South Canterbury DHB. Adapted by HealthInfo clinical advisers. Page created May 2017. Last updated June 2018.